Tesla has been selected to build the largest lithium-ion battery solution in the world near Los Angeles. It will “hold enough energy to power more than 2,500 households for a day or charge 1,000 Tesla vehicles,” the company says. The deal to build the facility comes after the recent methane gas leak in LA at the Aliso Canyon natural gas facility, which was one of the biggest environmental disasters in US history. The leak displaced 8,000 California residents and caused more environmental damage than the Deepwater Horizon oil spill. The leak went on for months before it was eventually plugged. One of the undocumented downsides is that now Los Angeles doesn’t have a power facility to fuel the city during peak demand, and it puts the Los Angeles basin suddenly at risk of rolling blackouts as winter approaches. After the leak, California governor Jerry Brown declared a state of emergency and the California Public Utilities Commission quickly began the process of procuring a replacement energy solution. 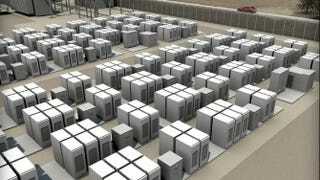 Ultimately, Tesla was selected to build a 20 MW/80 MWh Powerpack system. The most amazing part about it is that Tesla says it will have the Powerpack ready and deployed in just three months, thanks to the company’s giant Gigafactory. The Powerpack won’t be in Los Angeles exactly, but at the Southern California Edison Mira Loma substation, about 40 miles away from Los Angeles. This is all part of Tesla’s master plan to build large scale energy solutions. The company recently acquired SolarCity, a solar energy company created by Tesla founder and CEO Elon Musk. Southern California is a notoriously difficult market for energy companies, and thus, a great testing ground for Tesla’s ideas. Musk, it seems, means business.